Donna came to us on a cosmetic referral. She previously had two veneers placed on her two front teeth that were extremely distracting. In addition, she was not pleased with the overall aesthetics and color of her smile. Donna presented with uneven gingival contours, her two front teeth were of improper size compared to the rest of her smile, her remaining teeth were too short, and she exhibited a yellow shading to her teeth. Together we evaluated her smile and determined that Smile Design was needed to complete her look. We were able to reshape her teeth, change lengths were indicated, and give her the color she desired. Donna now looks beautiful. Her smile is in proper proportions, the coloring is very natural, and she is very pleased with the final results. 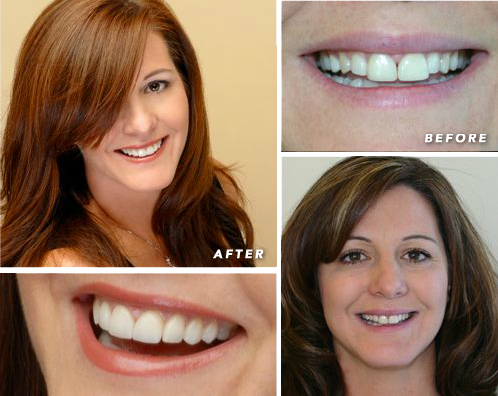 Donna is a great example of what properly thought out smile design can accomplish. I came to Dr. Gombert in hopes that he could fix the less than desirable dental work I had in the past through another dentist. Initially, I was hesitant that I would receive the results I had so long hoped for. For the first time, I have a dentist I actually look forward to visiting. Dr. Gombert and his staff go out of their way to make patients feel welcome and explain dentistry. I love smiling now and my family and friends noticed the change not only in my appearance but in my attitude. The world always looks brighter from behind a smile.